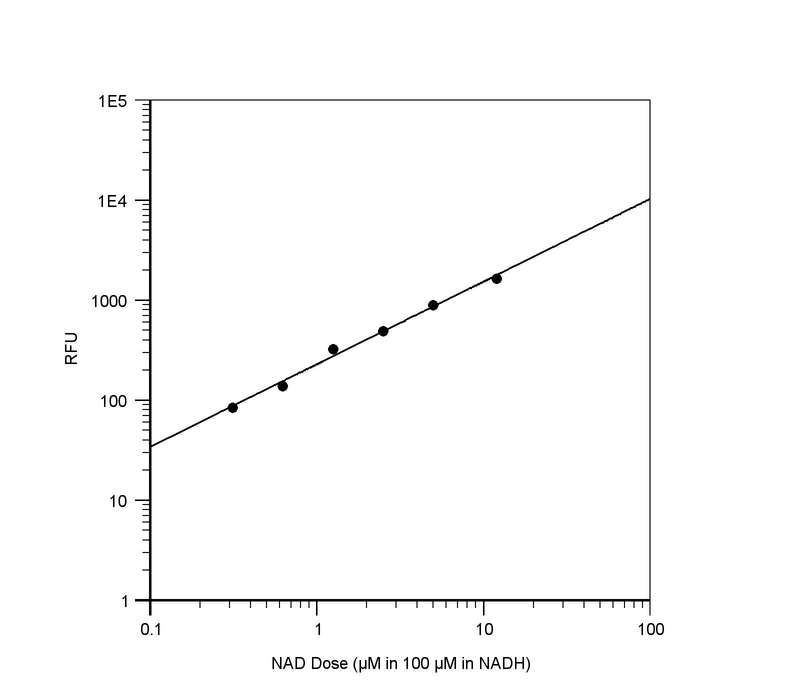 NAD standard curve with 100 µM NADH in presence in the solution. As low as 0.3% of NAD (~300 nM) converted from NADH can be detected with 20 min incubation (n=3). RFU read at Ex/Em = 420/480 nm. Nicotinamide adenine dinucleotide (NADH) and its oxidized form (NAD) are essential cofactors for many enzyme reactions found in living cells. Quantifying the generation or consumption of these factors is an important method to monitor the enzyme-mediated reaction or screening the modulator or substrate of these enzyme reactions. There are several kits on the market to quantify NADH or total NAD/NADH amount, but detection NAD generation in the presence of large excess amount of NADH has been quite challenging to date because NAD has its absorption peak at 259 nm and does not fluorescence, making the measurement unpractical. Amplite™ Fluorimetric NAD Assay Kit provides a sensitive and rapid detection of NAD. The kit directly measure NAD using Quest Fluor™ NAD reagent, our newly developed NAD sensor. The proprietary probe used in this kit reacts only with NAD to generate a product that fluorescence at Ex/Em = 420/480 nm, and has little response to NADH. This kit can detect as little as 30 nM NAD in a 100 µL assay volume, and monitor 0.3% NAD generation in the presence of excess amount of NADH. This assay can be performed in a convenient 96-well or 384-well microtiter-plate format and can be used in high-throughput screening. Thaw each kit components at room temperature before starting the experiment. Add 500 µL of ddH2O into the vial of NAD standard (Component D) to make 1 mM NAD stock solution. Add 10 µL of NAD standard solution into 990 µL H2O or PBS buffer to generate 10 µM NAD standard solution (NS7). Then take the 10 µM NAD standard solution and perform 1:3 serial dilutions in H2O or PBS to get remaining serial dilutions of NAD standard (NS1 - NS6). Note: Diluted NAD standard solution is unstable, and should be used within 4 hours. Table 1. Layout of NAD standards and test samples in a black/solid bottom 96-well microplate. NS = NAD standard (NS1-NS7, 0.01 to 10 µM); BL = blank control; TS = test sample. Table 2. Reagent composition for each well. Prepare NAD standards (NS), blank controls (BL), and test samples (TS) according to the layout provided in Table 1 and Table 2. For 384-well plate, use 25 µL of reagent per well instead of 50 µL. Add 20 µL Quest Fluor™ NAD Probe (Component A) solution into each well of NAD standard, blank control, and test samples, mix well. For 384-well plate, use 10 µL of Quest Fluor™ NAD Probe (Component A) solution instead. Add 20 µL Assay Solution (Component B) into each well, mix well. For 384-well plate, use 10 µL of Assay Solution (Component B) instead. Incubate the reaction at room temperature for 10 - 20 minutes, protected from light. Add 15 µL Enhancer (Component C) to each well to make the total NAD assay volume of 105 µL/well, and incubate at room temperature for 10 - 20 minutes, protected from light. For a 384-well plate, add 7.5 uL Enhancer (Component C) instead, for a total volume of 52.5 µL/well. Monitor the fluorescence increase with a fluorescence plate reader at 420/480 nm. Figure 1. NAD standard curve with 100 µM NADH in presence in the solution. As low as 0.3% of NAD (~300 nM) converted from NADH can be detected with 20 min incubation (n=3). RFU read at Ex/Em = 420/480 nm.